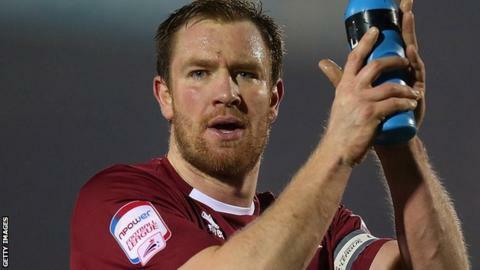 Northampton Town captain Kelvin Langmead will not play for the club again before next year, according to boss Aidy Boothroyd. The 28-year-old had surgery on his knee after a comeback in last season's play-off semi-final at Cheltenham. Boothroyd said: "We rushed him and that's had a big detrimental effect on him. We're paying the price for that. "I wouldn't want to put him under any pressure but we're now talking next year, definitely." Langmead was the club's player of the year in 2013 and the Cobblers have signed Matt Heath,Paul Reid and Mathias Doumbe in his absence. "We've got to make sure he's 100% and when he is ready to come back, that we've done everything we can to make sure he doesn't break down again," said Boothroyd. "He's finding it quite frustrating, not being involved and not helping. "He has had a couple of setbacks but we've got him on a programme. He's spoken to [knee specialist] Andy Williams and we have a plan for him." With the Northampton squad now over 30-strong, Boothroyd admits he will have to look at cutting that number. "I think there does need to be a balance," he said. "I've never liked a big squad. I think it can work against you because you can't keep everyone happy. We'll see if we can do something about that. "But, in the meantime, I'll focus on being happy that we've won a game at last and obviously we're looking forward to playing Fleetwood on Saturday. "It's about getting points on the board. We've got a bit of climbing to do."